You Are Here: Home » Home Improvement » Can A Handyman Install A Dishwasher? Can A Handyman Install A Dishwasher? Whether you are replacing an existing dishwasher or installing one in the kitchen for the first time, you may need someone to help with the process. If it seems a little over the top to hire a plumber or contractor to install a dishwasher, a handyman might offer the best price quote to complete the project. These individuals install dishwashers regularly and can make the modifications and installation quickly. Since a first time installation is more complex than replacement, the full installation will be discussed here. 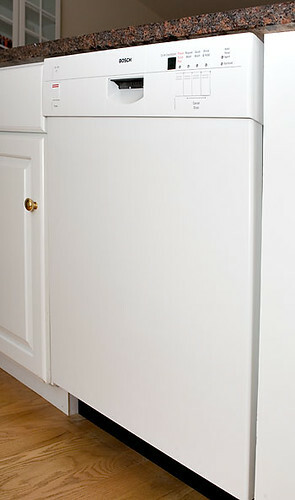 Dishwashers generally require 24 inches of horizontal clearance in the lower cabinet. Most people find they are most convenient when installed to the right of the sink. If it is impossible to locate the machine to the right, installing dishwashers to the left is acceptable, but much less handy for the right handed person. With prefabricated cabinets used in many homes today, it may be possible to remove a base unit to make room for the dishwasher. With custom cabinets, the installer may need to cut a portion of the base cabinet to make room for the dishwasher. Both the water supply and drain are served through flexible rubber hoses. These hoses need access to a hot water supply pipe as well as a sink drain. The handyman can make necessary plumbing modifications when installing dishwashers. In homes with a garbage disposal, the disposal may already have fittings for the dishwasher drain. In the United States, most dishwashers operate off a 110 power supply. Due to the energy used in heating water and drying dishes, it is best if the machine is powered by a dedicated circuit. With new installations, the circuit may also need to be installed. Installing the machine from scratch can take up to 16 hours for a good handyman. Replacing an existing machine can often be accomplished in less than four hours. The exact time can vary due to many different circumstances. A good handyman is talented in many different areas including carpentry, plumbing and electrical. The individual should be licensed to work in your city. In addition, it is important for these individuals to be insured and bonded. This provides protection for the handyman as well as the homeowner. Ask to see the required paperwork before allowing the individual to work on your home. A good handyman will be able to do most home improvements for clients. If the individual is good at his job, he will inform the homeowner when a task is beyond his capabilities or experience. In many cases, the handyman will be able to recommend other professionals in the field that have the needed skills to complete tasks that he cannot. However, in most cases, the handyman is an excellent choice to install dishwashers. Phillip Yorrick is a freelance writer dedicated to home improvement. He has written for many blogs, websites, and even magazines. He recently has been covering the many uses of handyman services.